New Whitnash Town manager Tony Clarke wants to put the smile back on the faces of the players at the Acre Close club - and he believes the best way to do that is to win the Coventry Alliance League. Despite being a major force in the Premier Division, Town have yet to win the title, with an agonising penalty miss with the last kick of the 2014/15 season the closest they have come to sealing the crown. Last season a title challenge failed to materialise and Clarke, who took time away from the game to deal with his daughter’s health issues, said the club has to set their sights higher. “I had a break of 18 months and this season I was ready to get back into it,” said Clarke who was number two at Chasetown before his self-imposed exile. “I wanted to start local and it’s somewhere I’ve helped out. I know the set-up, the nucleus of the squad and the surroundings and after talking to the club I snapped their hands off. “I could have gone higher but I see this as a challenge. “The aim is to win the league. We’ve entered four cups and we want to go on cup runs and have success. 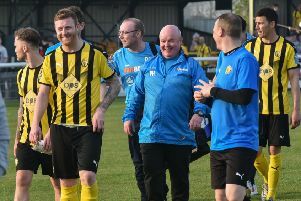 Clarke, who will be assisted by fellow ex-pro Andy Taylor, has wasted no time in strengthening Town’s options ahead of a five-strong friendly schedule. And, he said shirts are up for grabs, starting away at Studley on July 12. “It’s gone a bit stale in the last couple of years and the players needed a kick up the backside. “They need to know they have to earn the shirt. No one is guaranteed a place. “We’ve brought in players I know and players Andy knows and we’ve got ten new lads in to give us strength in depth. Town follow up their trip to Studley with a home friendly against Copsewood on July 16 (3pm).